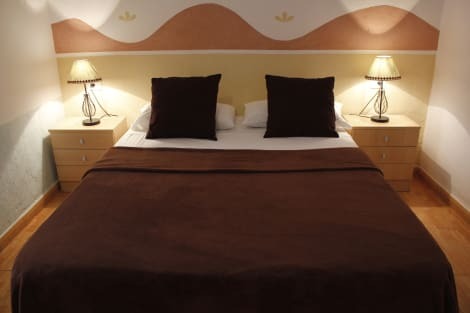 The Occidental Santa Cruz Contemporaneo is situated in the heart of the Santa Cruz, just a few minutes away from the Tenerife North Airport. The hotel's location is its main advantage as it facility the entrance and the exit to and from the city. The major shopping streets are also just a stroll away from the hotel. Each of the 150 rooms are tastefully furnished to portray the ultimate in comfort and style, lending a distinctive atmosphere of luxurious tranquility to the hectic schedule of business people and tourists alike. 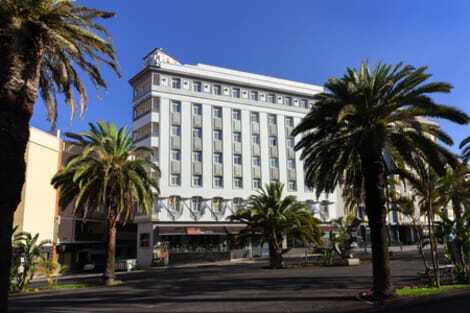 This stylish hotel is situated about 100m from Garcia Sanabria Park in Santa Cruz de Tenerife. Iberostar Grand Hotel Mencey is located in a unique colonial-style property where guests will enjoy the refined luxury of the hotel's splendid fully-refurbished rooms and common areas, together with impeccable standards of service. Make yourself at home in one of the 93 air-conditioned rooms featuring minibars. Complimentary wireless Internet access keeps you connected, and satellite programming is available for your entertainment. Private bathrooms with bathtubs feature complimentary toiletries and hair dryers. Conveniences include safes and desks, and you can also request cribs/infant beds (complimentary). 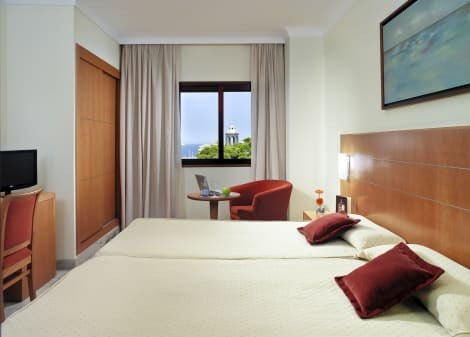 The Hotel Silken Atlántida is our 4-star hotel located in the new commercial and financial centre of the capital of Tenerife, Santa Cruz de Tenerife, on the shores of the Atlantic Ocean. It is the perfect city for leisure thanks to the fantastic temperatures in the city all year round, reaching an average annual temperature of 21°C. Shops, malls, beaches, restaurants, varied cultural events and a unique ecosystem make Tenerife one of the most sought-after destinations for travellers from all over the world.The Silken Atlántida is located close to the three largest shopping malls in Santa Cruz: The Corte Inglés, the Meridiano and the 3 de Mayo. Just 10 minutes’ walk away you can find the spectacular city Auditorium, designed by the prestigious Valencian architect Santiago Calatrava; the Marine Park, with 22,000 m2 of salt-water pools combining the island’s volcanic nature with modern buildings and the Palmetum, the botanical garden of the Canary capital. By walking just a few minutes more from the door of our hotel on the north of the island of Tenerife, you will find other tourist attractions like the Museum of Nature and Man or the Heliodoro Rodríguez López Stadium. 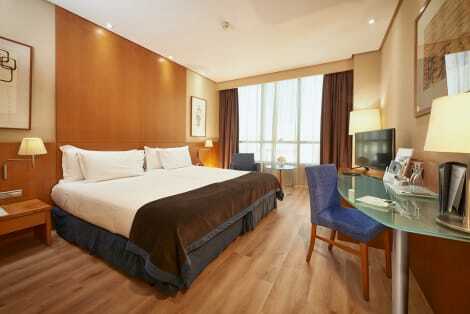 Make yourself at home in one of the 40 air-conditioned rooms featuring minibars. Complimentary wireless Internet access keeps you connected, and satellite programming is available for your entertainment. Private bathrooms with bathtubs or showers feature rainfall showerheads and complimentary toiletries. Conveniences include phones, as well as safes and desks. Grab a bite at Gom, one of the hotel's 2 restaurants, or stay in and take advantage of the room service (during limited hours). Wrap up your day with a drink at the bar/lounge. Buffet breakfasts are served on weekdays from 7 AM to 10 AM and on weekends from 7:30 AM to 11 AM for a fee. Featured amenities include luggage storage and a vending machine. Self parking (subject to charges) is available onsite. The hotel is situated in one of the best areas of the city - Residencial Anaga - near to the sea and close to the Nautico Club. It is ideal for relaxation thanks to its convenient location, just 1km from Plaza de España but away from the bustle of the city. The tourist centre of Puerto de la Cruz is less than 40 minutes away by car. The Norte/Los Rodeos airport is only about 14 km from the hotel and the Sur/Reina Sofía airport is 64 km away. 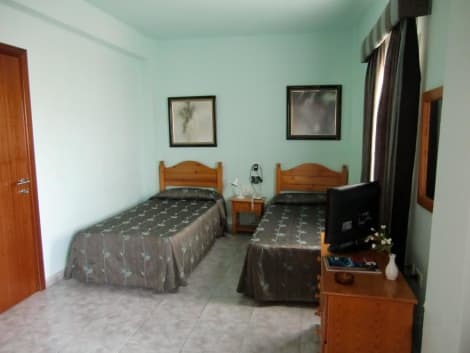 This completely refurbished hotel offers 40 rooms, situated on two floors and a lower area leading to the street. Dining options at the hotel are to be had at the cafeteria-restaurant. Guests can take advantage of the internet access and private car park. The comfortable, air-conditioned rooms have an en-suite bathroom with a shower and are fitted with all the necessary amenities. Enjoy a meal at Tajinaste or snacks in the coffee shop/café. The hotel also offers room service (during limited hours). Quench your thirst with your favorite drink at the bar/lounge. Buffet breakfasts are available daily from 7:30 AM to 11 AM for a fee. 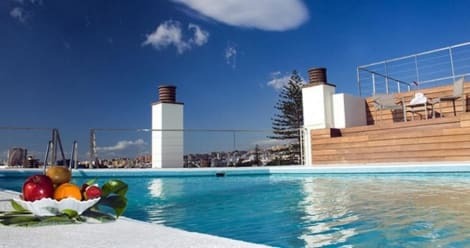 lastminute.com has a fantastic range of hotels in Santa Cruz de Tenerife, with everything from cheap hotels to luxurious five star accommodation available. We like to live up to our last minute name so remember you can book any one of our excellent Santa Cruz de Tenerife hotels up until midnight and stay the same night.